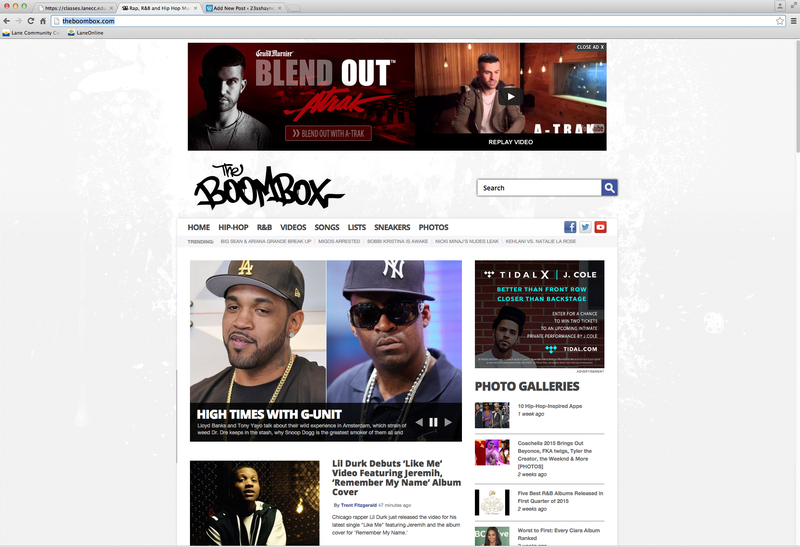 The BoomBox.com is a blog site keeping you up to date with current Hip-Hop and R&B news. From the latest video’s to the hottest fashion, the information keeps uploading. You’ll never fall behind on the hottest artist and what there’re up to. If you are wanting to know whats new for your favorite hip-hop song, look no further. It can be a strong resource when trying to find new inspiration for songs. With a simple white background and a few places to click, this site is simple to navigate and well made. With links that bring you to credible sources, I feel confident when coming to this site for accurate news. Whether you want to know about your favorite artists next video shoot, or what they are wearing you can find it on the boombox.com If you need a little fun for the day be sure to click on the list tab. Here you can find fun lists of things for example, top ten things to do while listening to your favorite artist. If you consider yourself a fan of Hip-Hop or R&B, be sure to keep the theboombox.com in your mind when looking for blogs. You can be sure when using this site that the information will be fun and informative. This entry was posted in Sp15-P3 Blog Search on April 21, 2015 by 23sshayne.